So sad that I am no longer up in SF, but good for my wallet I guess. On the day I left, we packed a ton of yummy food in so that I won't have withdrawal symptoms. =P We stopped by Hello Desserts! in San Jose. Ms. Lin wanted to take me there the day we went to the concert, but we got back too late. So better late than never! ^_^ They have a policy of no pictures inside, but I got'em! *click click* The interior was very clean and they were not busy at all that Friday afternoon. Ms. Lin ordered the Island Paradise Fruity Delight, which was their second most popular dessert. The pictures were very nice and it was very refreshing. 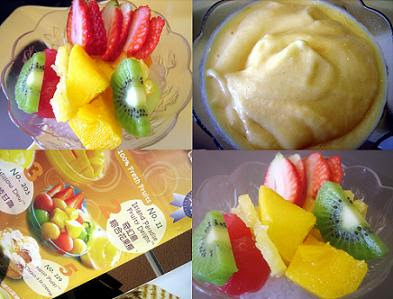 It comes with fresh fruits and sago in one bowl and a blended Mango Moo in a separate bowl. You can eat them together or separately. 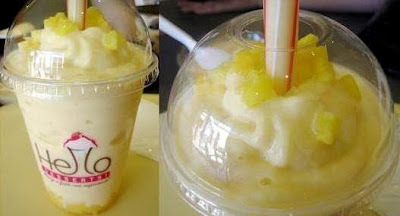 I couldn't decide what to get so Ms. Lin recommended the Mango Moo drink. It's a freshly blended mango smoothie with mango jellies on the bottom and mango bits on top. I didn't care for the jellies because I find chewing them while drinking a little annoying, but that's personal preference. The drink was delicious and refreshing. 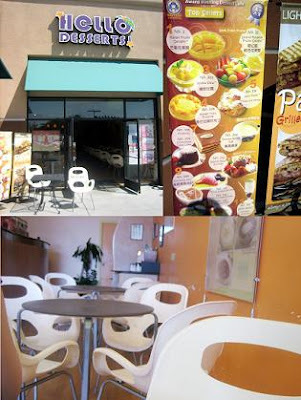 If they had a place down in OC, I'd be there quite often for the Mango Moo. Lucky San Jose people! !